Good things come to those who wait. Longtime AAPL member and NAPE attendee Casey Jobe is typically back on the road by the time the expo wraps up on the final day, but for Summer NAPE 2018, he and his partners stayed later than usual. So he decided to watch the must-be-present-to-win raffle drawing. All registered Summer NAPE attendees receive a raffle ticket with their name badge. Attendees are responsible for dropping their ticket into the raffle drum on the trade show floor, and they must be present to win. And quick — once their name is called, the winner only has 30 seconds to rush to the stage to claim the prize. When his name was called, Jobe was present and quick on his feet. His prize: a Harley-Davidson Iron 883. “This was the first time I was there when they were doing it. I was shocked to say the least,” said Jobe, CEO of Midwest Energy Investments LLC in Oklahoma City. Once the excitement of the win died down, Jobe started thinking about the greater impact his unexpected prize might have. His 4-year-old daughter, Lyla, has cerebral palsy and attends Washington Irving Elementary in Edmond, Oklahoma. “They have a phenomenal program for those with special needs. But as is often the case, resources are sometimes lacking," Jobe said. Jobe turned to his good friend Desmond Mason — a former NBA star who’s earned a name off the court for his artist talents and charity work — for help. “The first thing he ever painted for me was a portrait for Lyla,” Jobe said. Other works followed. “Casey and his business partners became collectors of my work,” said Mason, founder and president of DMason Art LLC in Oklahoma City. “We all developed a friendship that connected not just us, but our families. So when he won the bike and presented the idea of me painting it for a charity raffle, it made all the sense in the world in my eyes." During his 10-year NBA career, Mason played for the Seattle Sonics, the Milwaukee Bucks, the Oklahoma City Hornets and Thunder, and the Sacramento Kings. He also won the 2001 NBA All-Star Slam Dunk contest. But basketball isn’t his only lifelong passion. Add art and helping others. At Oklahoma State University Mason majored in studio art, and in recent years he’s sold hundreds of his works of art to benefit charities. “When I was young, there were people that used their gifts and blessings to give me a chance and that changed the path of my life and family. I think it’s only right that I do my part and try to impact as many lives as I can,” he said. Though he has painted a few cars, this is Mason’s first bike project. He chose a motif of silver metallic stars and stripes — inspired by Jobe’s military background. Jobe served in operations Iraqi Freedom and Enduring Freedom before taking a direct commission in 2009 as an Army engineering officer. Promoted to captain, he served for 2½ years as the higher headquarters company commander for the 2nd Battalion, 290th Training Support Regiment, 5th Armored Brigade. He now serves as a reserve force officer in the Selective Service, Region III. Jobe plans to raffle the bike off on the last day of NAPE Summit. He worked with the Edmond Public Schools Foundation to establish a special fund for the raffle, which is open to the public. Tickets are $20 for one, $100 for six, $200 for 15, $500 for 40 or $1,000 for 100 and available online at www.edmondpsf.org/custom-harley-raffle.htm and at Midwest Energy’s NAPE booth (No. 4515). And for this raffle, winners don’t have to worry about rushing the stage. They don’t even have to be present to win (so no need to interrupt any NAPE deal negotiations). “We’ll do a drawing through Facebook Live or something like that so everyone can watch,” Jobe said. 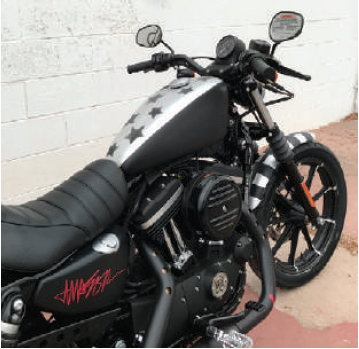 “We are anticipating a great raffle for an amazing cause,” Mason added, “and someone will go home with the first ever DMason Art/Harley Davidson hand-painted motorcycle and — most importantly — impact the lives of some amazing young people."